Lidgard, Scott (Co-editor), Lynn K. Nyhart (Co-editor). 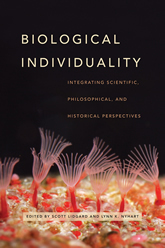 Biological Individuality: Integrating Scientific, Philosophical, and Historical Perspectives. University of Chicago Press, 2017. Individuals are things that everybody knows—or thinks they do. Yet even scholars who practice or analyze the biological sciences often cannot agree on what an individual is and why. One reason for this disagreement is that the many important biological individuality concepts serve very different purposes—defining, classifying, or explaining living structure, function, interaction, persistence, or evolution. Indeed, as the contributors to Biological Individuality reveal, nature is too messy for simple definitions of this concept, organisms too quirky in the diverse ways they reproduce, function, and interact, and human ideas about individuality too fraught with philosophical and historical meaning.